Talk about great motivation and reward potential! Because of the continuing love students have for our acclaimed Recorder Karate method, we commissioned the amazing artist Jennifer Vulpas to create a unique manga/animé-style character for each certificate. 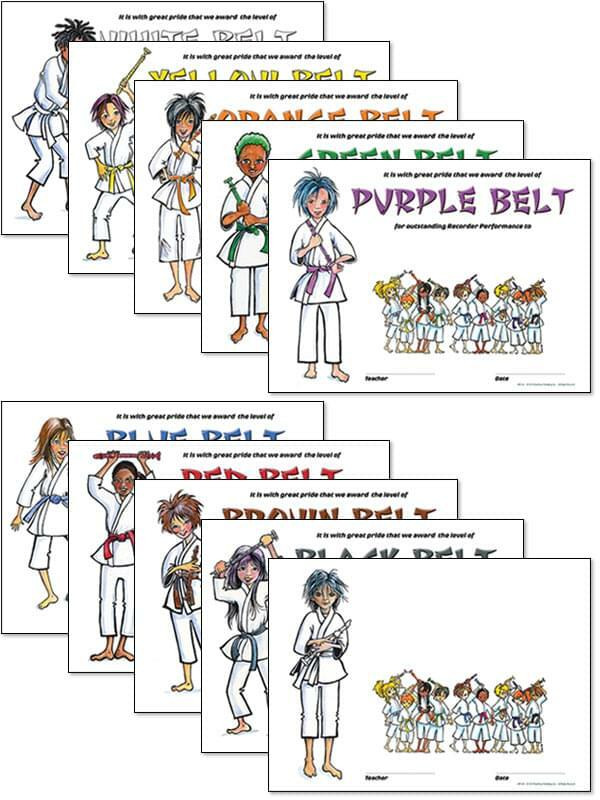 There is a certificate for each of the nine levels and nine colors of belts, as well as one special certificate with a blank heading and no color for the recorder in the picture. This way, you can print your own unique award for special occasions and belt colors. You can either use your school printer or have them created by hand, perhaps by your own students. For instance, make a special red and green belt certificate to award for your holiday concert! The possibilities are almost endless. Each certificate is printed in full color on high-quality 8 1/2" x 11" paper. They give you a great motivational tool for your recorder program, and give your students wonderful awards to hang on their walls at home. Think of the pride your young players will feel!